Current rate of species extinction is exceeding background rates by 100 to 1000 times as a result of changes to ecosystems by humans. It is paradoxical then, that Australia's most pressing extinction crisis could be due to too little human disturbance. This project is examining the hypothesis that a lack of indigenous land management has precipitated the collapse of Australia's mammal fauna. It will test the capacity for indigenous land management to forestall further mammal declines and restore degraded ecosystems while providing an innovative pathway for enhancing indigenous livelihoods. It combines with the Can Indigenous fire management restore mammal communities? Nimmo, D. Bird, R.B. (Pennsylvania State University), Bird, D. (Pennsylvania State University), Ritchie, E., (Deakin University) (2016-2019) Hermon Slade Foundation, $85,971 project to create what is essentially one major project. 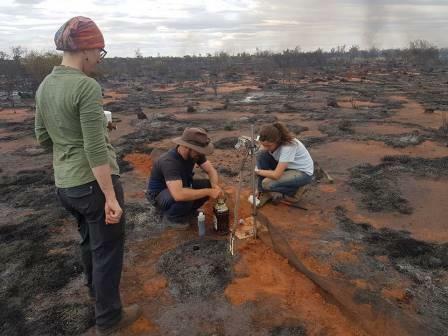 The researchers have selected 60 sites in various fire mosaics, mosaics with differing fire history, close to and far from the Parnngurr community in the Western Desert (400 km west of Newman, WA). Two cameras have been set up at each site to capture visits by both predators (dingoes, foxes and cats) and small native marsupials such as bilbies, mulgara (a small carnivorous marsupial), dunnarts, and antechinus. 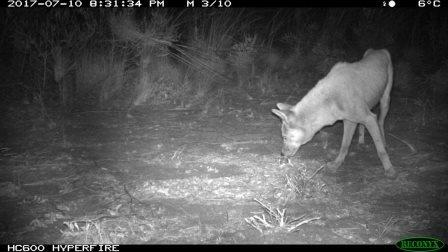 The researchers are expecting that the information that they collect from the cameras, which will be left in place for long periods of time, will help them determine whether or not the fire regime being implemented close to the Parnngurr homelands creates more diverse habitats (resulting in more native marsupial species) and encourages more dingo predation of feral cats. Expected outcomes of this study range from on-ground principles for integrating indigenous knowledge into biodiversity conservation, to transformative insights on the interdependence of humans and their environment.